As a business, you likely have more than one department within your walls. And even if you don’t, there’s probably someone working for you wearing multiple hats. Just like there is a need for someone to do several jobs across departments, there’s a need to manage multiple Twitter accounts easily and efficiently. Numerous brands have multiple Twitter accounts for the same reason a company wouldn’t want to overwork a single employee. There are different tasks, goals and KPIs to measure across every department. And like any business, max efficiency and complete control over your daily workflow is critical. 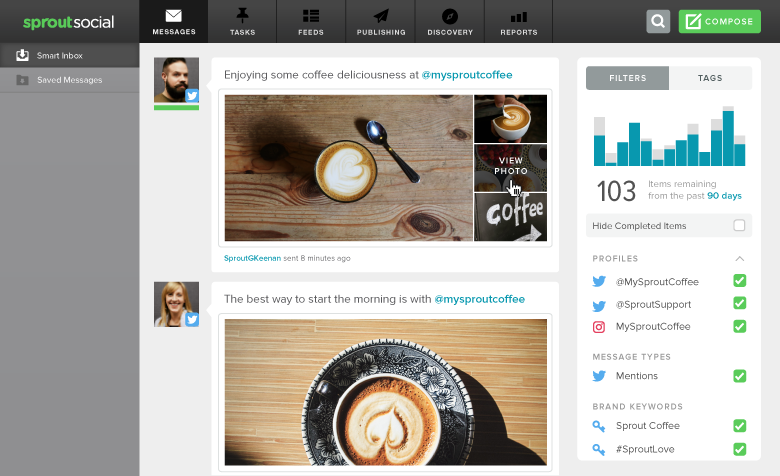 That’s why Sprout Social’s Twitter management tools truly work best for businesses managing two or 200 accounts. With our collaboration features, single-stream inbox and CRM tools, your Twitter can turn into a fully-functional social media customer service hub or a publishing platform for every account. Our goal is to provide the best tools to save you time and money. Don’t believe us? 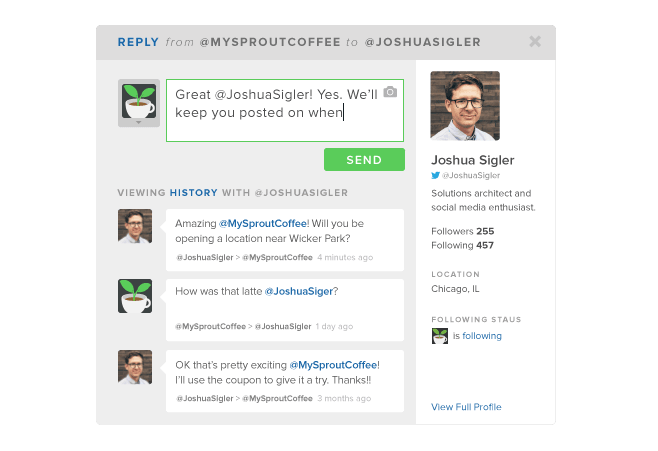 Try Sprout Social for a free 30-day trial. Managing multiple Twitter accounts shouldn’t be something that intimidates your brand or causes you headaches. You don’t need a second location, 2 million followers or 20 different products under your belt just to start another Twitter account. It’s important to know that two or more accounts doesn’t have to be a time-waster for you or your social media manager. In fact, a Vertical Response infographic stated 63% of small business CEOs spend one to five hours on social media every week. Instead we’re here to go through the reasons why you may want to consider multiple Twitter accounts and what it takes to manage them all together in an effective and timely way. If you’re in the mindset that your one Twitter account is working just fine and that adding another would get messy, would you say the same thing about your social media campaigns? Building up your online presence is no easy task and many marketers rely on multiple social media campaigns to do so. However, you probably haven’t used a single campaign to build your presence, so why why stop at one Twitter account to help your marketing and audience growth? Even if you’re still debating whether you truly need multiple Twitter accounts, we still recommend that you read onward to gain more knowledge on the benefits you could have with extra social channels. There’s a lot different reasons why you might need more than one Twitter account for your business. But for starters, having access to more than one gives you more accountability and control of your social media strategy. In this example, Oculus, the virtual reality tech company, was able to gain accountability for its delayed shipping. On the other hand, there was no need to update this for their Oculus Story Studio account, which is set more-so on news in the virtual reality industry. Promoting alumni news, giveaways, campus updates and awards could take up a school’s Twitter feed on its own. That’s why it’s necessary to keep both handles separate so information is always accessible. Colleges often have more than one dining hall and typically offer late night food options. Having accounts for each facility is needed if you have different hours, locations or food options. Universities tend to have emergency health notifications, general physicians, depression clinics and even sports medicine departments. Having an account for each department could relieve some of the headache of various important medial questions coming in via social. Any staffer in an university admissions office can tell you the questions never end–so why not have a specific Twitter just to answer them? Admissions often receive the most amount of Tweets and during acceptance periods, the volume gets even higher. More than likely the only department with a higher volume of Tweets is the athletic department. It’s getting more popular to have Twitter handles for each major athletics club associated with the university. Athletic departments have found it much easier to divvy up the handles rather than answer all the questions on one school account. Before mid-terms and finals, libraries are a busy spot on campus. Twitter accounts specifically for these facilities provide insight for changing hours and research options available. Each dorm has its own unique set of standards. Students can get instant access for issues like power outages, plumbing issues and other maintenance problems. Avoid seeing these questions pop up on the university’s main feed by owning more than one account for dorms and student-living maintenance. Think about the possibilities for different departments in your business that could relate to the multiple working parts between your walls. Universities are responsible for handling a great amount of information and individual handles could help spread the word. Employee advocacy is a critical part to businesses of all shapes and sizes and being able to have human resources, product and company-wide updates on Twitter makes things easier. Additionally, advocacy programs like Bambu help bring social and employee engagement together. As we’ve mentioned many times, social customer support continues to be a major factor for businesses. Having the ability to monitor incoming questions, tag messages to certain campaigns and respond to issues right away is a major benefactor to any large company, Social Times reported. Keep customer service questions separate from your promotional content so you don’t have customers complaining next to your giveaway Tweets. Another popular reason to have multiple Twitter accounts is so that businesses can easily manage technical support issues. If you’re counted on to be live and available 24/7, you better have a handle to address the questions as they come in at all hours. (Note: You can manage tech and customer support questions on Twitter during regular hours, but make it known in your bio). Large enterprise companies often operate in different regions and countries. More businesses are finding it helpful to have Twitter handles for specific locations, services and languages so they can efficiently tailor and personalize their information. Depending on what you do and where, it helps to have more than one account for your customers to go to. Many large businesses often have CEOs and social media managers posting relative content about their industry. It’s smart to build your brand on your personal Twitter as well as your business account, Grow reported. As a business owner, this helps you get the word out through multiple outlets while becoming a resource or influencer in your industry. It also helps put a face to the business when the owner is active on social media. Even if you’re not an enterprise business or university, you can more than likely relate to at least one of these instances above. It’s important to create different handles for each unique part of your business that needs to be constantly updated or managed. Essentially, you don’t want to mix up your brand posts with numerous other updates that could have gone out on a customer support or a regional Twitter handle. Now that we have looked at who uses and why someone might need more than one account, let’s figure out how you’re going to do all this multitasking. For starters, you need to cut out all of the clutter of multiple accounts. The last thing you want to do is log in and out of Twitter all day long to get from one account to the other. Additionally, if you have more than one person with permissions and passwords, collaboration can get awfully tricky when it comes down to publishing and scheduling posts. 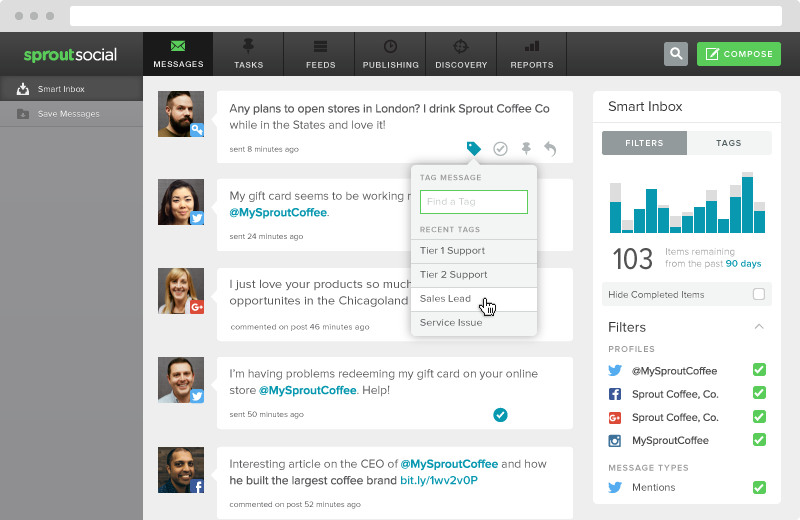 With Sprout Social, you have the ability to control, manage, monitor and collaborate your accounts with a single-stream inbox. Having the ability to add multiple users to your account allows you to stay on top of all incoming messages to each account. Our social inbox is perfect for businesses who are juggling with permissions and users on their social accounts. In fact, these tools help you tag, filter, route and mark all incoming Tweets and Direct Messages so you don’t have to worry about stepping on toes or mixing up posts. If you attempt to handle several social accounts all on their native platforms, you’re probably going to lose some hair. Why stress yourself out when you can centralize these messages and address questions, comments and concerns in a more orderly fashion? You’ll hear us time and time again talk about the importance of social media engagement and building profitable relationships with your potential and current customers. But you might not have the time or resources to address everything that comes your way on each native platform. Avoid the social media blunders that come with sharing passwords and having employees accidentally post personal messages on business accounts. Centralize and organize your messages so you can get through everything without missing a critical piece of information. Like we mentioned earlier, it’s best to build relationships that can be profitable and actionable to your marketing campaigns. Social media gives you that outlet to give shoutouts, thanks or immediate help to those who want to avoid the customer service phone conversations and the dreaded “please hold” elevator music. Instead, identify and prioritize your most important Tweets on each of your Twitter accounts. Once you’re able to indicate these messages, your team can collaborate and respond more efficiently. This will ultimately build trust in your customers and foster relationships that turn into very happy customers. Managing Twitter accounts doesn’t have to take up all your time. By finding new opportunities with customers and saving time on interactions, you can feel more comfortable behind the wheel of several accounts. Use the tools around you to ensure you have have content published whenever you want. This will prevent you from spending every second answering Tweets and sending out new ones. Make the most of your Twitter accounts and increase your social audience by being present on Twitter.